Ooiee at the Cocktail bar. The Renaissance, which took place between the 14th and 17th centuries, was a period of cultural and artistic flourishing across Europe. The era is mostly famous for its art, which includes some of the most iconic and beautiful pieces of all time. The Renaissance is easy to get to – outbound on Sukhumvit Road, do a U turn after Km 160 and about 200 meters back down, Renaissance is on your left. Don’t worry if you haven’t heard of the Renaissance – it only opened last September. Renaissance is better known for Leonardo da Vinci (Mona Lisa), Michelangelo di Lodovico Buonarroti Simoni (statue of David), Raphael and Donatello; however, the architects decided to ignore the famous Renaissance men, either that or I missed Mona. The entrance is open air, wide and majestic and somewhat overwhelming, and runs you up to the enormous lobby. If that isn’t breathtaking enough, we asked for directions to their Pebbles restaurant and were told it would be better if we took a buggy. As they seemed quite insistent, we acquiesced and took the buggy. It was only then that we understood the property runs from Sukhumvit right down to the sea! It is huge! And it was sand, rather than pebbles! The restaurant is also large, seating 119 pax we were informed, with three separate areas – an outside section overlooking the sea, an indoor cocktail bar and an indoor (air-con) dining area. We chose the outside, not at all cold and very relaxing. 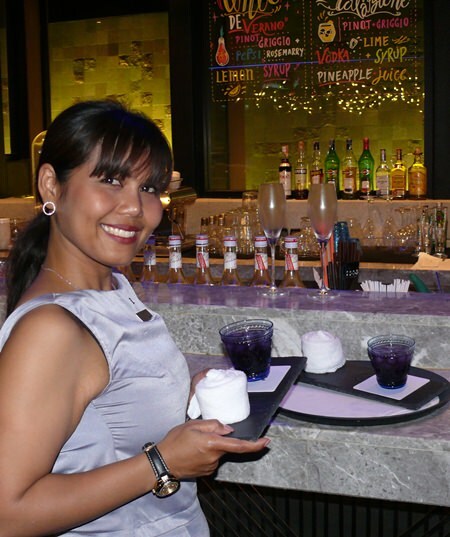 We were served by Ooiee, who was just a bundle of joy, and nothing was too much trouble. The menu is novel, being on a clip board, and most of the wines are also available by the glass. Cocktails are numerous around B. 320. Around B1100 for the bottled wines and B. 230 for the glass. I chose a Monsoon Valley Colombard, a very pleasant Thai wine. Getting ready for some steamed items. We shared 12 Fin de Clair oysters (600 baht for 6) as an appetizer, and there is no mistaking the quality in French oysters. Other appetizers range between B. 385-560 but the butter poached lobster with a cherry wood smoking was B. 860. Signature mains are B. 630-960 but lobster again is at a premium B. 1995. 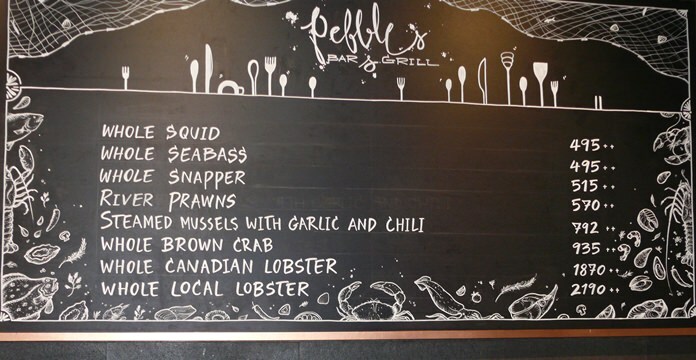 Grilled seabass, pork belly, sea trout and beef tenderloin are all under B. 960. Sides are B.100-120 and include a Bombay potato and beer battered onion rings. Ooiee was on the job yet again and talked me into a dessert, though I was very tempted by the cheese board at B. 540. 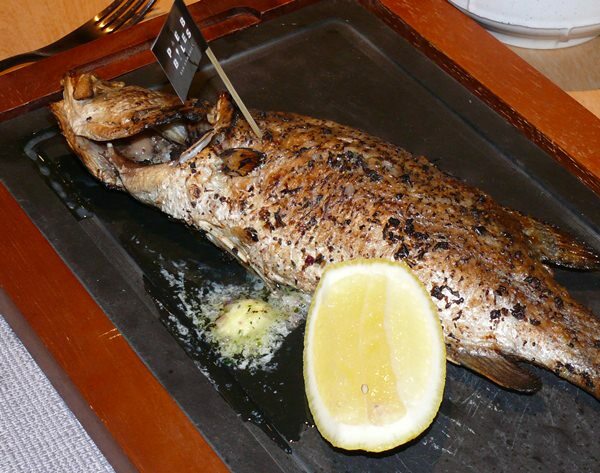 A grilled seabass for Madame. 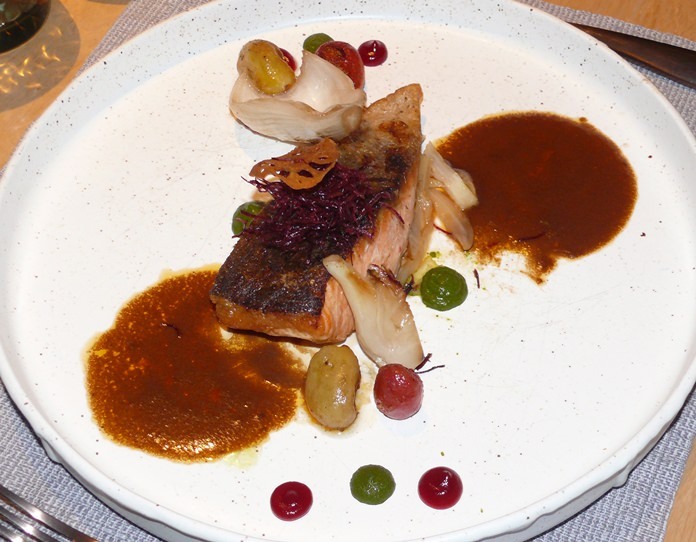 We were very impressed by the Renaissance’s Pebbles restaurant and grill, with the cooking under the very watchful eye of Chef Martin Bower, culinary director. We have been told to never trust a skinny chef. That being the case, Martin is totally trustworthy! We enjoyed our evening, and Ooiee made it special. The presentation of the food items was excellent and every time correctly prepared and cooked. The items were not overpriced (Fin de Clare oysters are six for 600 baht) and my grilled seabass only B. 630. It is new and different and gets our recommendation. 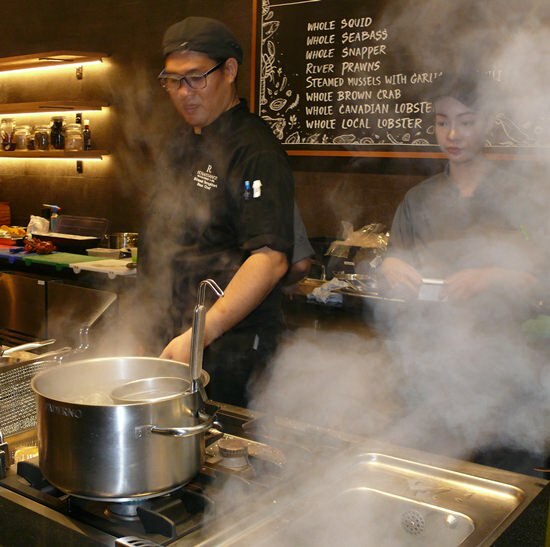 It really is a ‘renaissance’ in dining in Na Jomtien. Do try. 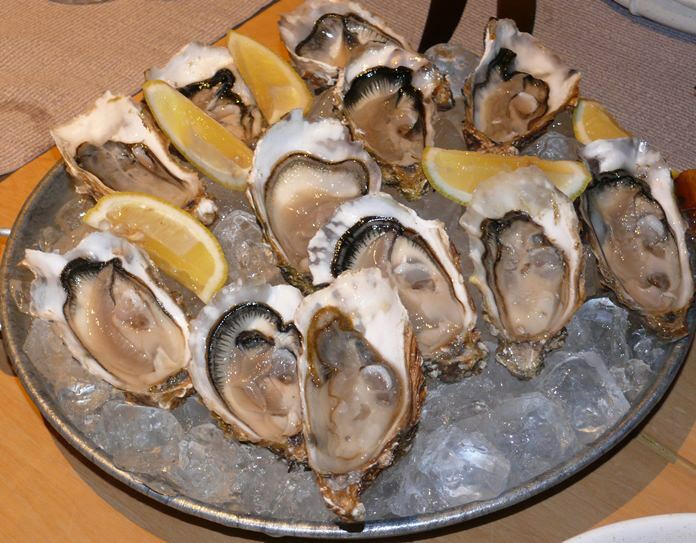 Renaissance Resort, 9/9 Moo 3, Na Jomtien, tel: 038 259 099, secure parking in resort’s car parks, open 5 p.m. till 11 p.m.
A large plate for Fin de Claire oysters.